Weight 8340 lbs. Fresh Water 50 gals. Sleeps 5 person(s) Grey Water 51 gals. Int. Colour Stone Black Water 25 gals. Beautiful open concept layout in this Winnebago fifth wheel, lightweight design towable by most half tonne trucks! This trailer would be like bringing your home from home! So much space and all the luxuries. This Minnie Plus has the Extreme Weather package, enclosed and heated tanks. 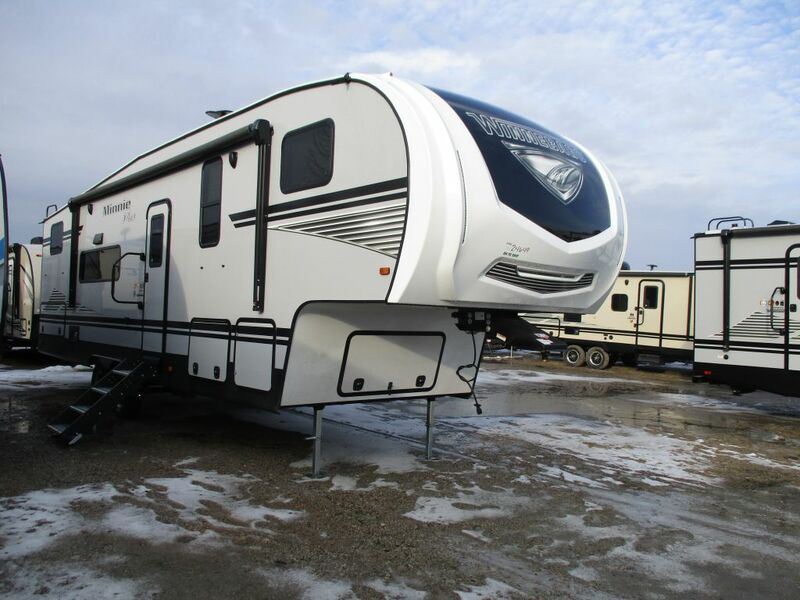 There is a large 17 ft power awning to add for extra living space with exterior speakers and LED lights. Step inside to open concept living, kitchen island with sink, full size residential kitchen appliances, dinette at the rear. Full sized tri fold sofa for guests to sleep. Cozy fireplace with LED TV above for end of day wind down time. AV system AM/FM/CD/DVD/USB/Bluetooth. Full size queen bed upstairs in the front, so much closet and storage space! Beautiful comfort in style! Come out to see ! No hidden fees, only add the tax!